Formula 1 team bosses have agreed to keep ongoing discussions with Liberty over the details of F1's post-2020 future a secret. After Friday's presentation from Chase Carey and Ross Brawn to the teams at the Bahrain Grand Prix, F1 issued a press release prepared in advance, which outlined the main points of Liberty's vision for grand prix racing in 2021. This gave the impression that Liberty had only talked of relatively vague goals, when in fact teams were privy to much more information that they are obliged to keep private, and will continue to do so as talks to continue. "I think we're going to avoid getting into specifics of what was discussed this morning," said McLaren's Zak Brown. "That was what was agreed amongst the teams and Chase and Ross. "Overall the impression is very positive, and I think the direction which they're taking is the right direction. "There's obviously a lot of detailed questions, but we'll do that behind closed doors." 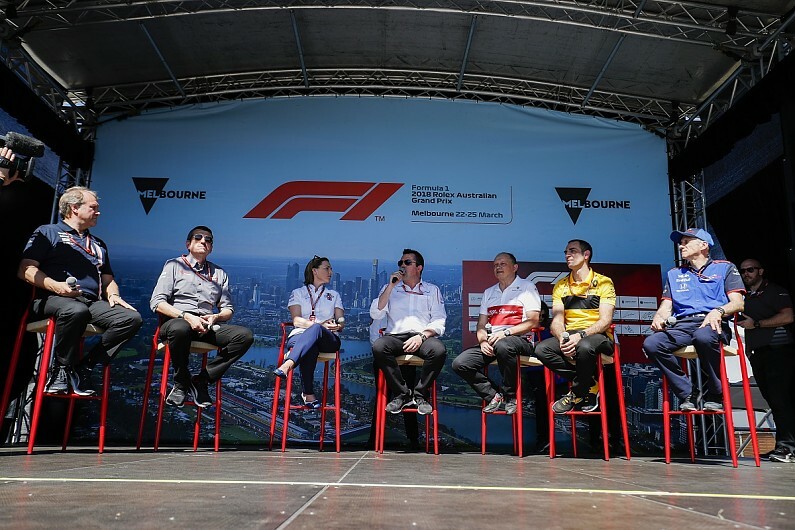 Haas team principal Guenther Steiner confirmed all teams had agreed to keep the details of the discussions private, and said the proposals were not a "blueprint" until they are signed off. "There is something between a blueprint and a wish list, which is called a proposal, and that's what it was," he said. "It's not a blueprint yet, it's something in between. It's a good starting point. A very good one actually. "For sure everybody goes away and comes back with questions. We are at a point where we need to change something to attract people, attract fans, to do what we need to do to make the sport the leading sport in the world." Claire Williams agreed it was more than just talk and is adamant Liberty is serious about its push for change, and won't back down on its key goals. "I'm personally delighted with the proposals they laid down," she said. "I know that in the past you can have these conversations and they come out and not necessarily anything is done about it. "I'm not sure these discussions are negotiable. That's the message I got anyway. "There were obviously elements in that proposal which are under FOM's control and others which are under the FIA's control, but I believe that FOM and FIA are working together. "As I've always said, if we're going to protect the future of this sport then we're going to need to work collaboratively, all three stakeholders." Force India deputy team principal Bob Fernley urged Liberty to now put "more meat on the bone" of its proposals. "I think it's a process that the FIA and F1 are going through, and they'll come to the final conclusions over the next few months," he said. "It's very, very rewarding from our side to be included in that. "We're participating in it as individual teams, rather than collectively, which is also a good solution to some of the issues we've had in the past."